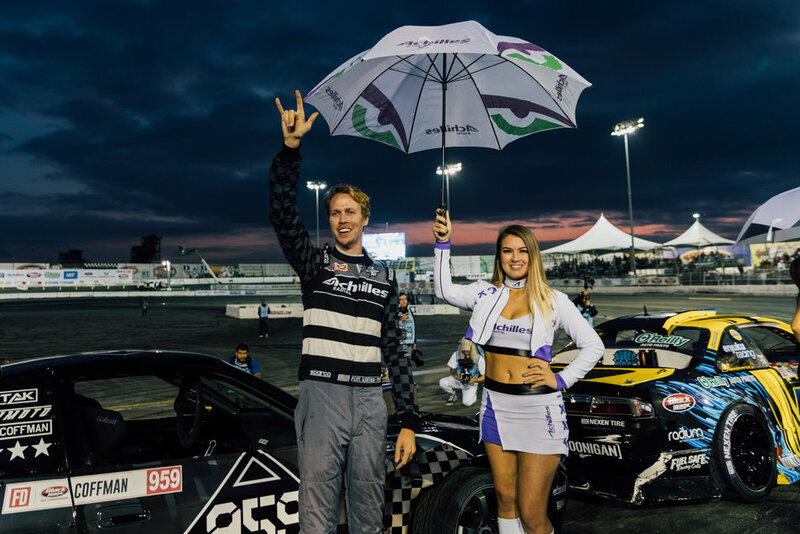 The final round of the Formula Drift 2018 season took place last weekend in Irwindale, California at Irwindale Speedway. Irwindale had been slated for destruction at the end of 2017 but, thankfully, that didn’t happen. Irwindale has been a particularly troublesome track for the team in prior years but the team was ready for the challenge. Thursday and Friday the team practiced feverishly to prepare for qualifying and the competition. After a few runs and adjustments to the car, Matt was driving the track with great confidence. The Achilles tires provided great traction and excellent speed. In the final practice run before qualifying, Matt put the rear end of the car into the wall when he initiated. The team quickly repaired the car for qualifying, but making contact with the wall right before qualifying is a frustrating mental game. Matt's first qualifying run reflected the prior impact as Matt was low on the big bank. The judges scored the run as a 72. Matt improved significantly on his second qualifying run but the run was scored as a 75. Frustrating results but at least we had qualified and the car was ready for battle. Saturday, we were up against Chris Forsberg for Top 32. Matt chased Forsberg with excellent proximity and style. On Matt’s lead run Chris made contact with Matt’s front wheel causing Chris to spin. Matt was awarded the win and we moved on to the Top 16 where we would battle Vaughn Gitten Jr. The drivers lined up for the Top 16 introductions for the fans, then it was time to battle. Vaughn got a bit of a jump on Matt off the line and Matt had to fight to catch up. On Matt’s lead run the same thing happened to Vaughn but Vaughn was able to catch Matt in the transition, knocking Matt’s rear bumper off. Vaughn kept great proximity the second half of the battle and the judges awarded Vaughn the win. This was the end of our 2018 season, but the team was in good spirits and watched the rest of the competition together in the stands. Vaughn went on to win the entire event, as our team cheered him on. We would like to give a big thanks to all of our friends, fans, and sponsors who supported us this Season. Our next event is the SEMA show in Vegas, Nevada starting on October 30th. Find our car in the Thunderbolt racing fuel booth #34277. Matt will also be doing drift demos at SEMA ignited on November 2nd. The Ignited event is open to the public and admission is free if you use the promo code “COFFMAN”.